There are many complaints against this movie being registered in a plethora of YouTube videos, blog posts, and the like. Could a simple story change have made the difference, and convert the naysayers into pleased fans? One of the more obvious and common complaints is that the movie’s background chase, with a dwindling Resistance fleet barely outpacing the First Order, doesn’t make a lot of sense. A compelling reason is given why the Resistance cannot just jump to light speed, but no similar reason is given why the First Order can’t send a ship or two on ahead. Some have noted that it is odd to speak about burning fuel while zipping through space, since fuel is only needed to accelerate or decelerate, but I’ll give the movie credit here. Let us just assume that the race is not about velocity but rather acceleration. The Resistance is able to out-accelerate the First Order, but to make use of that advantage means that they have to just burn the gas and go in a straight line. That said, these constraints would make it easy for the pursuers to predict their heading, so a short hyperspace jump would be all it would take to trap the fleeing scum. I first came across the utility vessel known as an Interdictor when I was playing a computer game called “Tie Fighter” on my first PC, back in 1995. One advantage that rebel X-wings had over their imperial enemies was the inclusion of a hyperdrive on all their star fighters, enabling hit-and-run raids. A Tie Fighter has to stay close to its base or support vessel. The way the Empire chose to neutralize this advantage was to deploy these modified VSDs, that forfeited some of their weaponry, shield generation, and star fighter compliment in order to carry enormous gravity-well generators. The effect of this gravity well was to prohibit hyperspace jumps nearby, presumably by making the necessary calculations impossible. With an Interdictor in the fight, the Empire could make sure that its advantage in firepower could be brought to bear on the smaller bands of rebels that they caught. 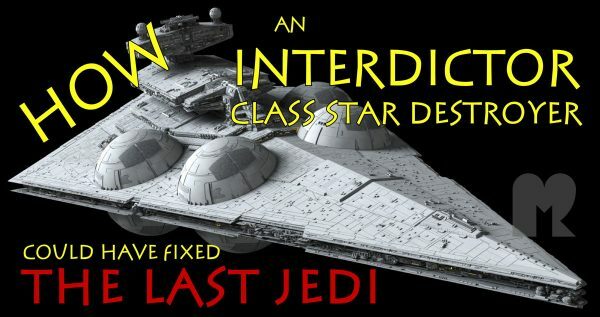 Now, let’s consider how The Last Jedi might have gone differently, if the First Order had been blessed with an Interdictor or two. Another common complaint is that bombers who “drop” bombs in space make no sense. Well, we might choose to give the movie a little bit of grace, and suppose that each starship generates some small gravity well of its own (we do see personnel walking upright on these ships all the time), so a bomber that gets close enough should feel the effects of that gravity well. It would have been nice if a brief line of expositional dialogue told us this explicitly – that the turrets have to be taken out so that the bombers can get close enough to be within the gravity field – but this wasn’t stated, and so the audience is left a bit perplexed. Enter an Interdictor, whose entire purpose is to be a giant gravity well, and suddenly bomb-dropping makes a ton of sense! The dire straits that the Resistance is in can be exposited to us while the bombers are setting up their run, and reiterated when we later see the fleet escape once the Interdictor is defeated. Can we go a bit further? Another complaint is the way Hux is made into a punching bag, by the disrespectful dialogue Poe serves up. I actually like this aspect of Poe’s character, so I think I’d be willing to keep that dialogue, but what is needed is a counter-balancing show of force by Hux, to make us all properly fear him again. What if Hux toys with the attacking bombers a bit, by suddenly ratcheting up the gravity well output, in a way that causes some of the bombers to crash, and maybe gives Poe a scare too, as he is barely able to pull up in time? The outcome of this battle, then, is that the Interdictor is at least disrupted, damaged enough that its gravity field goes down, and the Resistance jumps away. It would take some time for damage control to get the wounded Star Destroyer back online, so do you know what doesn’t happen? There is no magical “tracking us through hyperspace” plot contrivance. Instead, the pursuit must be picked up in some other way. If there is no tracking device to disable, then there’s no hacker side quest for Fin and Rose to enjoy, and there’s a fair amount of time to fill. Some other common complaints for this movie are the under-utilization of Phasma and the under-development of Fin. We need something for both of them to be doing… what if Phasma is hunting for Fin, seeking vengeance for what he did to her in making her complicit in the destruction of Starkiller Base? Let’s say that she has turned to bounty hunters or spies, not wanting to admit her failure to her First Order buddies, and it is her back-channel intel that leads to the revelation of where the Resistance fleet has jumped. Meanwhile, Fin can get screen time as he deals with the threats that are following him. She didn’t die, she used all-new force powers to avoid having her blood boil and tissue freeze while being exposed to radiation as she floated through space, oh and on top of that she pulled herself back in to an exploded hull. Credulity got stretched a bit thin by all of that. Why couldn’t her character have died? And why not make that death a glorious one, in keeping with her heroic stature? Sorry, Holdo, but your admirable sacrifice should really have been Leia’s to make. I’m talking about the Lightspeed Kamikaze scene, one of the very best features of this film. The First Order has caught them again, with a patched-up Interdictor, and with no more bombers to send the Resistance is truly caught. They cannot jump away, but then Poe comes up with a crazy idea: what if they jump towards? Holdo might be the one to poo-poo the idea, pointing out how light speed calculations are foiled by the projected gravity well, but Poe insists that as long as the gravity well is right in the center of the flight path, i.e. the jump is directly towards it, there should be no net impact on the computers. The thing is, navigational safeties will prevent the piloting of a ship right into another, so it must be done manually, and nobody is good enough to keep the aim true enough… Poe, as sure of himself as ever, claims that he can do it, but Holdo won’t allow it, until finally Leia speaks up, knowing somehow that she can do it. It is the force inside her, she knows that she is the only one who can, and so it falls to her to execute. Folks have been complaining a lot about the weaponization of light speed, noting that it changes too much of the dynamic of the universe, but if this is a tactic that only really works against an Interdictor specifically because it projects a giant gravity field that obscures all hyperspace jump calculations other than one aimed directly at it, then it is safe to unleash this “Holdo Maneuver” on the galaxy far, far away. It’s something that will really only make sense in this one circumstance. Then we can also avoid the emasculation of Poe’s character by having him come up with the plan to hide out at the salt planet, perhaps together with Holdo’s advice. Or, if we really do still want there to be some “chill out, fly boy” in this movie, maybe Poe can try to take out the Interdictor on his own as a way to try to prevent the sacrifice that Leia will have to make. But it quickly becomes clear that his star fighters aren’t going to cut it, and Holdo orders him back. The retreat to a planet can be framed as him coming to terms with Holdo’s wisdom. Is there a way that an Interdictor could change the way Luke’s character got developed? No, not really. But that’s okay. I’m fine with a disillusioned Luke who is ready to do things that were unthinkable to his younger self. I think that maybe a lot of the fans who find this a hard pill to swallow, though, might have been more accepting of Luke’s change, if the rest of the movie made more in-universe sense. By introducing an Interdictor in lieu of the Dreadnought, so many of the other complaints can be dealt with, leaving us with a more intelligent plot structure. So, Interdictors might have even helped here, from a certain point of view.